"An interesting collection or organisation design anecdotes, theories and opinions"
Organisation design is a tremendously nebulous concept. For many people, organisation design is simply an org chart, and it's an activity they shouldn't care about because it is the manager's job. I don't believe that, and nor does Naomi Stanford, author of The Economist's Guide to Organisation Design. In this book, Naomi sets out her vision of organisation design: a continuous, whole-organisation, multi-faceted discipline covering organisation structure, leadership, and business strategy. Based on her deep experience across a wide variety of organisations, she presents her vision using anecdotes, management theories, and personal opinions. Taking into account the ambition of trying to condense the entire topic of organisation design into 300 pages, this book is a very respectable effort. Expectedly though, there are many topics that are lightly glossed over and short on detail, which does make this book a challenge to properly absorb, at least if only read read once. Most importantly, however, despite the lack of detail in many places I was able to grasp all of the major ideas and themes. In the first chapter, the concept of an operating concept is introduced. This is a variety of internal and external factors that affect an organisation - it's mission, it's vision, legal, environmental concerns etc. Naomi emphasises how all of these factors can have a huge influence on the design of an organisation. And whenever the operating context changes, the design of the organisation should be reassessed and updated accordingly. What I found most compelling about operating context, are the many factors I don't normally think about, for example environmental, economic, political and legal. As software continues to eat the world, more of these factors will have a direct influence on the architecture of the software we create. In fact, I believe many of them already do, we're just not looking hard enough. Just like Domain-Driven Design and software architecture, organisation design is all about systems thinking and models. 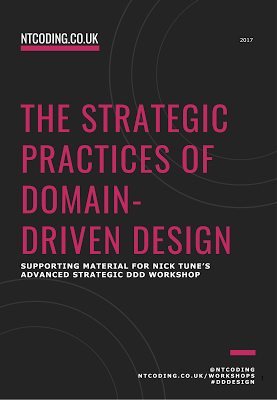 In fact, Naomi states that one of DDD's core principles - to experiment with models and find the best model - is a core principle of organisation, too. Some of the models Naomi talks about in the book could be really interesting from a strategic DDD perspective, too; Nadler and Tushman's Congruence Model, Burke-Litwin Model, Leavitt's Diamond, are all models that I am very keen to investigate in more detail and understand how they can be applied at the intersection of organisation design and software architecture, if no-one has investigated this already. The aspect of this book I found most disappointing were the case studies. Most of the case studies were just a couple of pages long. I can understand how Naomi wanted to add an example to the concepts presented in each chapter, but unfortunately, that meant each case study was a new story that had to be introduced instead of going deeper into the details. I would really loved to have seen one of the stories expanded into a proper deep dive. Perhaps I'm being unrealistic. In fact, I know I'm being unrealistic. I love organisation design and transformation experience reports - this book is not intended to be one of those. However, next time I'm enjoying a good transformation war story I'll be able to appreciate it in even greater detail thanks to many insights about business strategy and organisation design I got out of this book.